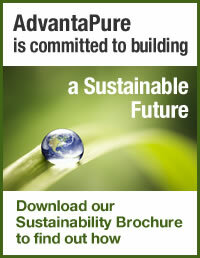 NewAge Industries AdvantaPure® Publishes "Building a Sustainable Future"
Southampton, PA — Plastic tubing manufacturer NewAge Industries has released its first sustainability report titled "Building a Sustainable Future." The publication describes the company's ideas, actions and commitment to implementing a sustainability plan and maintaining a green manufacturing facility. Ken Baker, CEO, stated "Although this is NewAge's initial sustainability report, we've always been a forward-thinking company concerned with the impact we make as a business and a member of the community. We've taken many critical steps, including the adoption of solar power, to demonstrate that concern, and this report helps readers understand the impact." Broken into several sections, "Building a Sustainable Future" covers all of NewAge's sustainability projects, the largest and most ambitious of which has been its renewable energy system. In 2011 the company installed over 4,000 solar panels on its roof and added other electrical equipment to harness the energy from the array. The system now generates half the company's electricity needs. The report explains other building improvements and gives hard facts on results. It cites dollars, energy and water saved, along with pounds of waste recycled annually. The changes have resulted in more efficient and brighter lighting; reduced heating and cooling costs due to the replacement of all windows; decreased electricity usage because of new, energy efficient motors in production areas; and reduced trash volume due to recycling and compacting. "Building a Sustainable Future" also includes measures taken by team members that involve helping the community. Events such as holiday toy drives, wellness programs, food and clothing collections, blood drives and local student education programs help to illustrate the nature of this successful, employee-owned corporation. "It's quite an accomplishment," said Baker of the many changes. "I'm excited to explore what improvements we can tackle next." For more information on AdvantaPure's commitment to sustainable business practices, contact the AdvantaPure team at 145 James Way, Southampton, PA 18966; phone 888-755-4370 or 215-526-2151; fax 888-258-4293 or 215-526-2167; e-mail: sales@advantapure.com. AdvantaPure, a division of NewAge Industries, specializes in clean products for the pharmaceutical, biomedical, food, beverage, chemical, and cosmetic industries. All products are manufactured, stored, and shipped using the cleanest methods possible to ensure unsurpassed product purity. In business since 1954, NewAge Industries is a manufacturer and fabricator of thermoplastic and thermoset tubing and hose, and a supplier of fittings and clamps. The company offers one of the broadest product lines of tubing, hose, and fittings in the U.S., and its custom extrusion and fabrication services are unrivaled. In 2006, NewAge Industries initiated an ESOP (Employee Stock Ownership Plan) for the benefit of both its employees and customers.